Today's guest post is from the Rebecca, the Towson Town Center GURU. Please leave a comment to welcome her to Maryland Pink and Green and let her know what gifts for guys you like the best. Looking for a standout gift for your boyfriend, husband, dad or brother? We all know how tough it can be to find gifts for guys! Read on for my picks from The Art of Shaving, Pottery Barn and The Sport Shop. 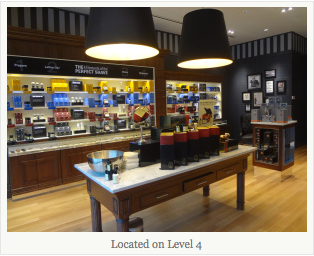 How about treating him to a skincare or shaving set from The Art of Shaving (Level 4)? It's an entire store dedicated to helping guys get The Perfect Shave™. 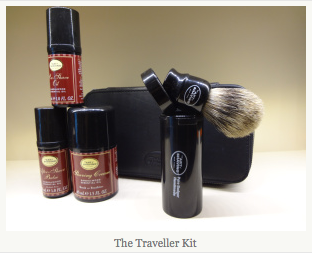 He can use this Travel Kit at home or on the go. 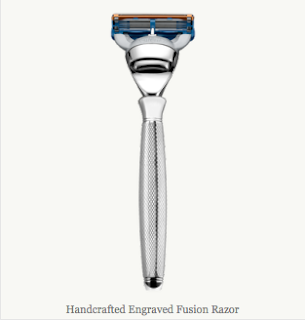 It comes with travel-size pumps of Pre-Shave Oil, Shaving Cream, After-Shave Balm and a Pure Badger Travel Shaving Brush. Choose from unscented, sandalwood essential oil, lemon essential oil, or lavender. If he's never used a badger shaving brush before, he'll probably never turn back. The store manger tells me that using one helps to create even more lather. If properly cared for, it can last for more than a decade! 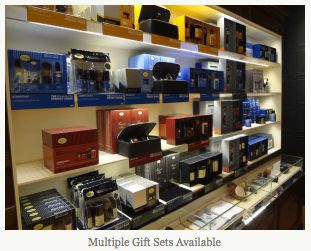 You can also spoil him with one of The Art of Shaving's handcrafted razors. The Art of Shaving breaks The Perfect Shave™ into four steps — Prepare, Lather Up!, Shave, and Moisturize — and offers products to go with each step. GURU Tips: Talk to an associate about your recipient's shaving needs, such as battling in-grown hairs, in order to get customized suggestions. You can save money by going for a bundled gift set. It can be of better value to buy a set instead of individual products. My next store pick may not be what you would expect... One guy I know seemed surprised when I mentioned Pottery Barn (Level 2) as a destination for gifts for guys. You'll find unique bar themed items and more! 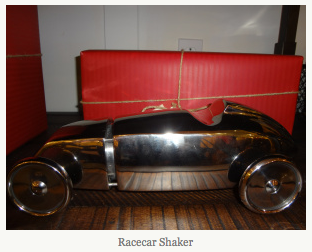 This vintage race car houses an extra large cocktail shaker! If he doesn't have a bar, he can park it on a coffee table or book shelf. It's a guaranteed conversation piece! 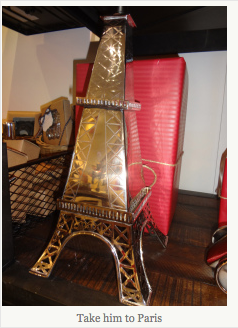 Whisking him off to Paris may not be in the cards right now, but you can stir up some ideas for the future or serve up a souvenir to remind him of a past trip with this Eiffel Tower shaker. If you want to do something really over the top, this shaker can also be a vessel for surprise plane tickets! With so many games on the video screen or in plastic form, it's not everyday that you see a game board that can double as a piece of art. 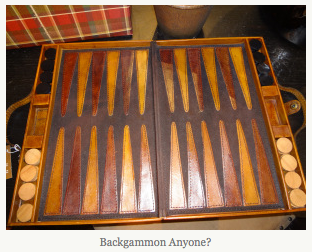 This leather backgammon set, available at Pottery Barn as well, makes for an inviting coffee table display. You can also have the set monogrammed. Say see you later alligator to trouble getting those shoes on! 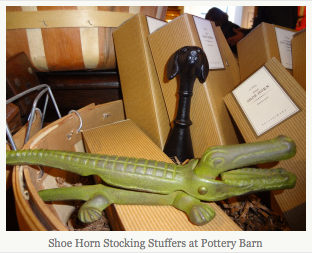 If you're looking for stocking stuffers for him, check out these fun shoe horns. Pick from a dog or the gator. You can't go wrong at The Sport Shop (Level 1), with a gift straight from "Ravens Country!" Along with classic NFL licensed jerseys and tees, you'll find endless accessories. There are mugs, a toaster that allows you to toast the home team and mark your breakfast with the Ravens logo, a set with a Ravens ice bucket and four cups, and MUCH MORE! This purple and white checkered button down with the Ravens logo has been flying out of the store. Or, you can go for a purple tie! Hope that helps make MISSION GUY GIFTS an easier one! Coming up throughout the week, watch for more gift ideas. Here are links back to some other gift posts. I recently featured Out of the Box toy ideas and gifts for the grandparents. Plus, here are more ideas for stocking stuffers for everyone in the family. Need a Secret Santa gift for the office party? Here are a few tips. As always, if you need help tracking down a gift for someone on your list, just leave me a comment and I'll jump on the case! This was a great post! As a male, I love the Art of Shaving. It's a great company. That said, I also love receiving technology, cologne (try chanel), and new wallets for Christmas. happy holidays, Maryland Pink and Green!